Certified pre-owned, or CPO cars, make a great choice for many reasons. There’s the limited factory warranty you receive, for one. However, lower prices can be a big advantage for Avon, Indianapolis, and Plainfield drivers, too. So, you might think you’re ready to start shopping. 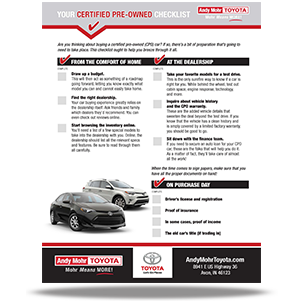 Before you do, be sure to pick up the free Your Certified Pre-Owned Checklist. Download yours today!